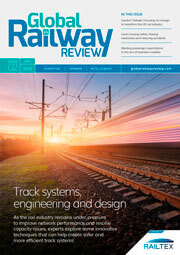 On 6 March 2019, Global Railway Review hosted a webinar in association with Siemens Mobility which explained their seamless digital supply chain for ordering spare parts and how the rail sector is already benefiting from this new technology. How do you see the transformation of spare part services and what is your solution? We are living in a rapidly changing world, accelerated by the era of digitalisation. This transformation brings us several challenges, but also a lot of opportunities. In the past, maintenance activities were carried out following a set of rules which were defined at the beginning of a system’s lifetime. This resulted in a lot of effort; having to manually search for the right spare part from printed catalogues and then delivering the spare part or carrying out repairs after a customer requested the service. With today’s advances in technology, we are now able to automate most of the processes using a seamless digitalised supply chain that is fast and much more cost efficient. With Easy Sparovation Part®, we are using additive manufacturing (3D printing) possibilities to make the parts better than before and print on demand. These are all outstanding solutions for our industry which results in fast and high availability of material supplies. What is behind your online shop Easy Spares® Marketplace? An essential part of the digital supply chain is the ordering process, which can now be performed quickly and easily with the Easy Spares® Marketplace. Our goal is to create the highest possible comfort in online shopping for our industry. Siemens’ spare parts and third-party spares from various suppliers are available in one marketplace, therefore making all materials available for a maintainer. This brings the idea of ‘one stop shopping’ even closer. Our customers benefit from real-time information of stock availability, delivery times and prices as well as specific material information and photos. We have already witnessed the world changing with many customers already optimising their purchasing processes. So far we have had 2,200 users from 350 different customers, with 60 customers regularly placing online orders with us. Additive manufacturing (3D printing) enables us to increase availability, performance and the lifecycle of spare parts. Based on our customers’ feedback, our experts combined their rail domain knowledge with the advanced possibilities of additive manufacturing to create Easy Sparovation Part® – the process for optimising, enhancing and equipping spare parts with new functionalities for a longer lifecycle. Furthermore, conformity declaration is included and more than 800 parts are already available for print on demand. This webinar is still available to watch on demand!